A couple of weeks ago I met up with Jess, Rob and their daughter Millie for the bump part of their bump to birth photo shoot package. I suggested Park Campus in Tivoli, which is always a brilliant place for photo shoots. It's really quiet and very pretty. The colours are spectacular at this time of year, plus it's got a lake and great trees for climbing. What more could you ask for! Rob wasn't keen on being in any of the photos, so it was just the girls. Millie was a sweetie and loved playing peep-o with me! 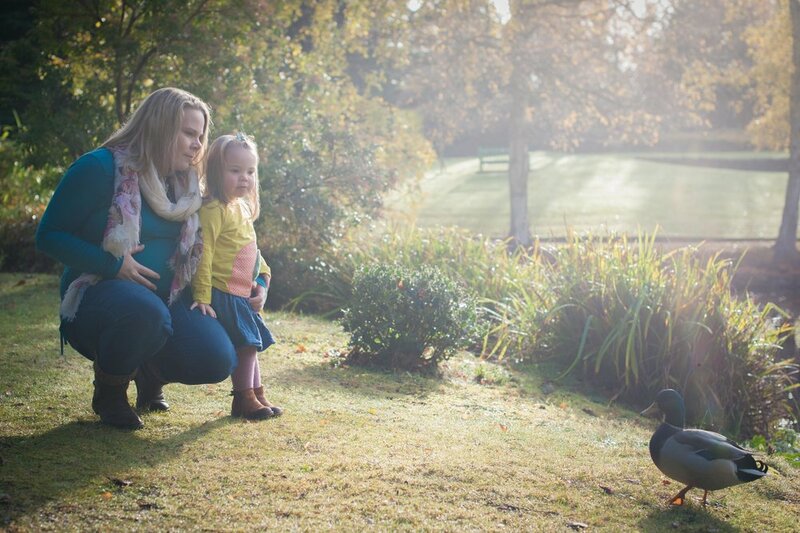 She and her Mum enjoyed a wonderful 30 minutes exploring the grounds and posing for a few informal pics. If you are expecting a baby or would like to book a photo shoot as a gift then please get in touch. I'd love to hear from you. You can reach me using my contact page or give me a call on 07983 465414. Thanks!